For when you're not sure what size fruit you want to eat. When you see apples encased in solid plastic, you read the label. Maybe they’re special. Limited editions that you can store away between your Sidney Crosby rookie card and the weird eggplant that looks like Joan Rivers. It was at the small Italian grocer near my house that I came upon the Grapple. “Looks like an apple. Tastes like a grape.” Even at $1.50 per apple I couldn’t resist the bizarre apple freak show. Or is a grape freak show? Perhaps blue sky thinking shouldn’t be allowed when it comes to cross-breeding. A relaxing bathing process prepares our apples for you or your kids. The apple takes on no additional sugars or calories. They are not genetically altered in any way. The apple is as healthy as ever but now has the new exciting grape flavor. 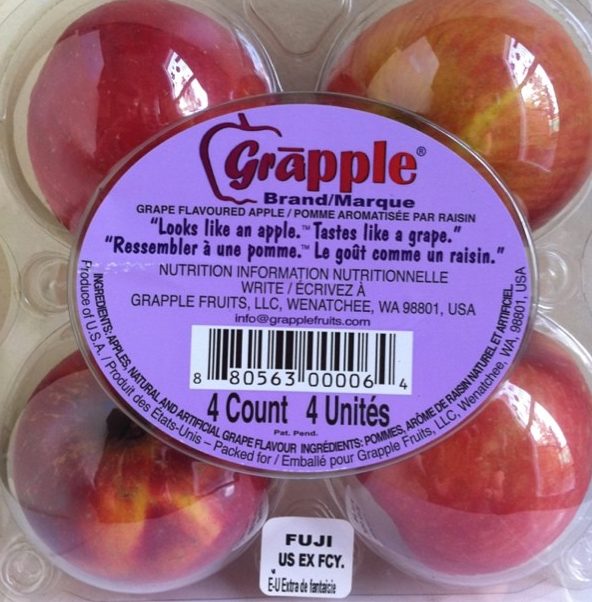 But FYI–the Grapple just tastes, well, like an apple. Who’s your daddy?